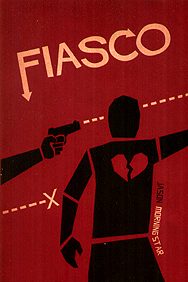 Fiasco is a game inspired by films like Blood Simple, Fargo, and A Simple Plan. During a session you and your friends will engineer and lay out stupid, disastrous situations that exist at the darkly comic intersection of greed, fear, and lust. It's like making your own Coen brothers movie - in about the same amount of time it'd take to watch one. For 3-5 players and 2-3 hours. No preparation required.